Embed "State of the Arts #15" on your page. 3 Segments: 1) Cuba: A Testament to Change; The Legacy of Cuban Designers 2) Amnesty International Human Rights Painting Project 3) Montgomery College Theater's "A Midsummer Night's Dream"
Embed "State of the Arts #14" on your page. Embed "State of the Arts #13" on your page. Embed "State of the Arts #12" on your page. Embed "State of the Arts 11" on your page. Embed "State of the Arts #10" on your page. 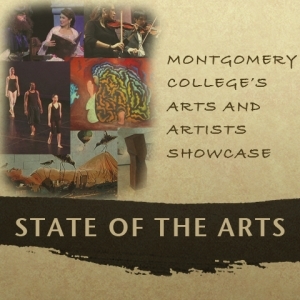 State of the Arts 9 covers Montgomery College professor Michael Sellmeyer's exhibition entitlted "Paper Scraps & Scribbles"; the "Songs About Love" classical voice and piano recital by MC professors Dr. Molly Donnelly and Dr. Jay Crowder; the "Seasons" illustration exhibition, which includes works by MC professors Martha Vaughan and Patricia Johannsen; and the concert by hard bop jazz quintet The Big Beat, a member of which is MC professor Ward Harris. Embed "State of the Arts 9" on your page. Embed "State of the Arts #8" on your page. State of the Arts 7 highlights the Classical Native music and poetry performances by the Taagi Three Sides Trio and Mohawk performer/educators Jan Longboat and Janet Marie Rogers; the International Student Project, a collection of photographs and stories showing the cultural and international diversity of Montgomery College students; and the 2008 Dance Showcase, a series of performances by Montgomery College dance students and the College's traveling dance troupe. Embed "State of the Arts 7" on your page. Embed "State of the Arts #6" on your page.